Granola is my ‘go-to’ breakfast and afternoon snack. This version has brown butter, warm spices, seasonal pumpkin butter and pecans for a nutty, toasty homemade granola! This year I just couldn’t get on board with pumpkin. While the rest of the world was pumpkin this and pumpkin that and OMG! #PSL, I was like eh. This is definitely very uncharacteristic of me. In fact, most years I am so pumpkin crazy that I even have an entire pumpkin themed week here on the ole blog. But this year? Well I’ve been a bit bored with pumpkin. Is pumpkin played out? Should we be moving on to other fall beauties like acorn squash or pears? Of course, I certainly hope that pumpkin is not out of style, yes even being in a pumpkin rut, but maybe it should be used in moderation. You know so that we can actually enjoy the iconic fall flavor. If you are wondering, this is only the third pumpkin thing I have shared on the blog this year (and it is only the fourth pumpkiny thing I have even eaten (besides a handful of pumpkin spice lattes, but those don’t count). I even debated about sharing it because, well, I am sure many of YOU are also sick of all that pumpkin and isn’t is almost gingerbread season anyways?!? 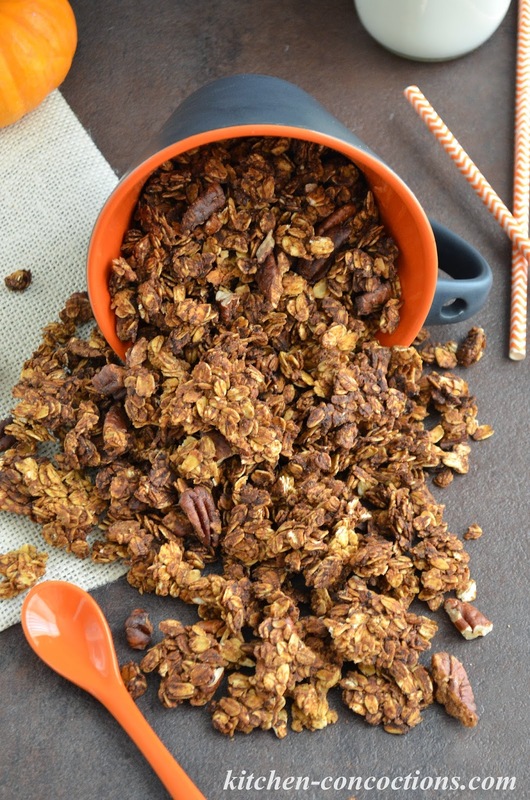 I actually whipped up this granola after I had some pumpkin butter just hanging around from another recipe and that I didn’t want to go to waste. 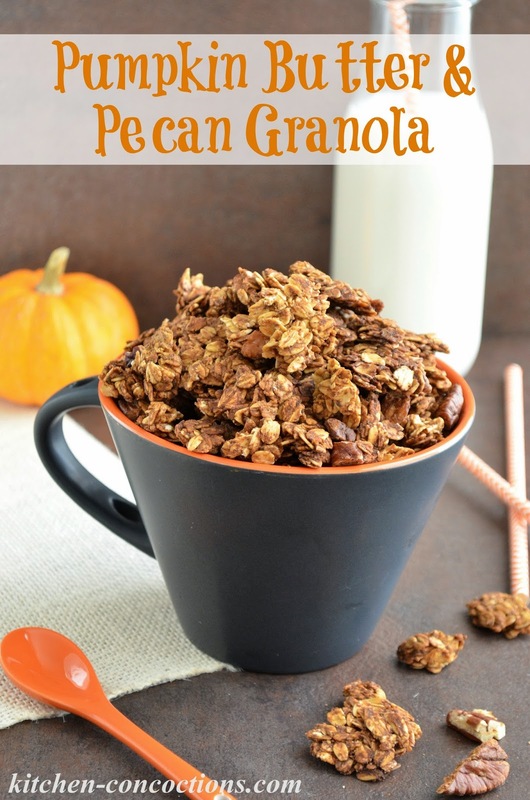 And while I already have traditional pumpkin granola and even pumpkin granola bars recipes that I love and have shared in previous (pumpkin loving) years, I really liked this version since it uses pumpkin butter, which totally changes it up! This version also uses very basic pantry staples and is really easy to whip up, you know when you do have a small pumpkin craving but don’t want to eat an entire pie. Oh and one last thing. This recipe has you brown the butter first, which lends to a nice nutty and toasty fall flavor. Hears to hoping I get my pumpkin mojo back for next year! In the mean time I am eating a big bowl of frozen berries, topped with plain Greek yogurt and this pumpkin granola. Moderation. One Year Ago: 50+ Pie Recipes for the Holiday Season and Beyond! 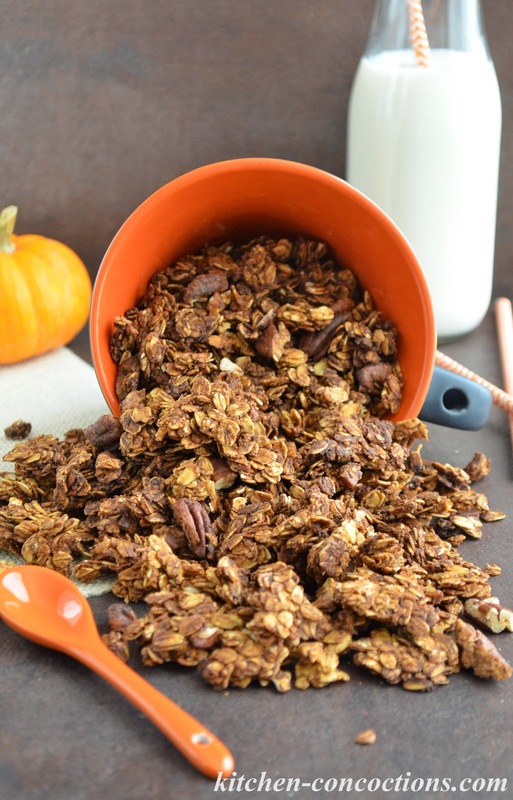 A toasty rolled oat and pecan granola with warm fall spices and a hint of pumpkin. Preheat oven to 300 degrees F. Line a baking sheet with parchment paper or spray with cooking spray. Set aside. In a large bowl stir together rolled oats, pecans and spices. Set aside. Meanwhile, place the butter in a heavy bottom saucepan and cook over medium heat, stirring constantly, until the butter begins to boil up and becomes foamy. Continue cooking and stirring until butter starts to smell nutty and toasty and turns golden brown in color and brown specks begin to form, about 6-8 minutes. Reduce heat, and whisk in the pumpkin butter, maple syrup, and vanilla. Continue whisking until fully combined, about 2 minutes. Pour the warm pumpkin butter mixture over the oats and pecans in bowl. Stir until the oats are evenly coated with the pumpkin butter mixture. Press granola into an even layer onto prepared baking sheet. Bake for 25-30 minutes, turning pan half way through baking so that the granola bakes evenly. Once granola is golden brown in color, remove from oven and cool completely. Using a spatula, break granola into pieces. Store in an airtight container at room temperature for about 2-3 weeks.